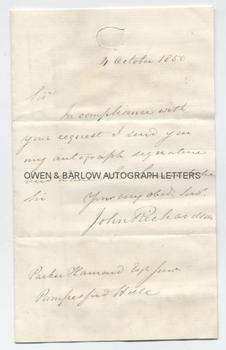 SIR JOHN RICHARDSON Autograph Letter Signed. British (Scottish) Arctic explorer, naturalist and ship's surgeon. ALS. 1p plus integral blank leaf. No place. 4th October 1850. 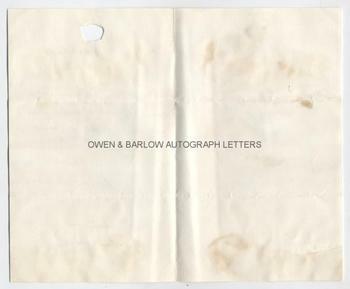 To Parker-Hammond Esq, Jr.
"In compliance with your request I send you my autograph signature and have the honour to be, Sir, Your very obed. servt. John Richardson." 8vo. Approx 7.25 x 4.5 inches. Embossed seal at head of first leaf excised. Old mounting residue on verso of integral blank leaf. Sir John Richardson accompanied John Franklin on the Coppermine Expedition in search of the Northwest Passage. Richardson acted as ship's doctor and naturalist and wrote the sections of the expedition's report dealing with geology, ichthyology and botany. During a second expedition in 1826, Sir John Richardson reached a point furthest east on the same day that Franklin reached a point furthest west. Together, the pair covered a distance of over 1,800 miles of previously uncharted territory. When Sir John Franklin later disappeared whilst on a subsequent voyage of EXPLORATION, Sir John Richardson travelled with John Rae on the unsuccessful search for Franklin in 1848-9. 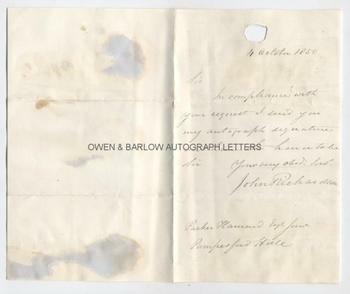 Autograph letters by Sir John Richardson are uncommon and this letter, responding to a youthful correspondent's request for his autograph, is unusual.